An annual dance festival celebrates the choreography native to the many cultures that have become American. Excerpts from the 20th Annual Collage des Cultures Africaines, celebrating the African Diaspora. For one night, dancers at Oakland’s Skyline High School transported the auditorium’s occupants to the shores of West Africa with rhythmic drumming that reverberated through the room. Dancers stomped and moved rapidly across the stage, their energy captivating their audience. Then came the mystical sounds of the Kura, a West African 21-string instrument, which when plucked makes sounds similar to those of a harp and a guitar. This was the 20th Annual Collage des Cultures Africaines (Collage of African Cultures), a partnership of local dance companies. Dedicated to celebrating the African Diaspora, the communities throughout the world of African descent, the event united over 100 participants, from musicians to artists, volunteers and local businessmen selling West African clothing and artifacts. This year’s theme, listed on the front of the program as “reflections on where we have come,” included musical and dance pieces from around Africa. “But in the process of looking back, we have several people that were instrumental in the choreography of Diamano Coura,” said Naomi Diouf, the artistic director of the dance group and one of the founders of the annual performance. Pieces like “Djembe love” celebrated Kimoko Sano, a choreographer with the African Ballet in Guinea, and included a collection of djembe (West African drum) pieces from different ethnic groups and different countries. Other choreography highlighted the Egyptian Nubians’ displacement from their land, where the Aswan Dam was to be constructed. The piece interpreted this moment through the “memory of village women collecting water each morning from the Nile River, a visage forever lost under the waters,” as described in the program guide. More than 40 years later, Diouf is still following her passion. For over 20 years, she has taught West African dance at Berkeley High School. She said that the teaching happens in the Berkeley classroom, and once students finish their schooling, they are allowed to continue professionally at Diamano. “Berkeley High is one of our recruitment grounds for the company,” said Naomi. She has many loyal dancers who have followed her since they were students in her classroom over 15 years ago. Diamano Coura is currently fundraising for their 40th anniversary, which will take place later this year. To find out more about Diamano Coura West African Dance Company, click here. 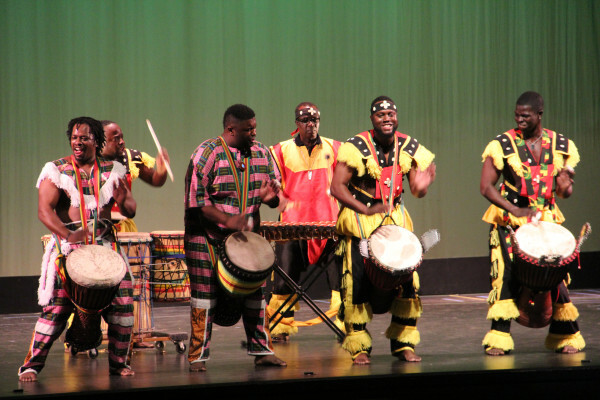 "African and African diaspora music and dance continue to inspire new generations of Bay Area residents. For the past 25 years, companies led by C K. Ladzekpo, Malonga Casquelourd, the Dioufs, and others have retained the core pan-African belief that one grows closer to both ancestors and the younger generations by keeping dance alive. Dancing with the spirits on Earth is a rehearsal for transcendence to the world of the ancestors. Saved by dance." enthusiastic response with the premiere of Bodeor, choreographed by Naomi and Esailama Diouf and incorporating sudden jumps, spinning arms and fierce, powerful ensemble work." "...look forward, as well, to the roof-raising West African stampings of Oakland troupe Diamano Coura."